Double Sided Quarter is guaranteed to come up heads every time! This Double Sided Quarter is actually made from two real quarters. Makes the perfect gag joke or good luck charm! Precision cutting slices two genuine quarters in half so two heads are obtained, the two heads are then carefully placed together making a double headed quarter, aka Double Sided Quarter. Picture is example and the two headed quarter you get might have different dates. Think of the fun you could have with this two headed quarter at parties, the office or with that big mouth neighbor! 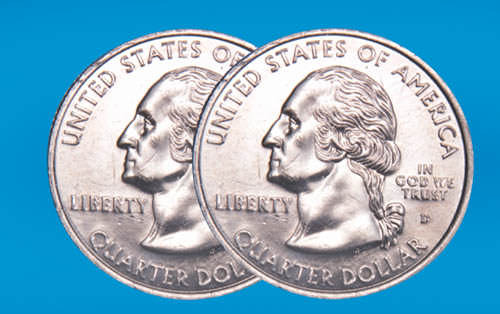 Keep your Double Sided Quarter with you and never lose a bet again! "I was at this bar last week. I had my special two sided quarter on me which I carry all the time. I figured I would play a fun joke with some buddies there. I got the two headed quarter out and told a guy, I will bet ya five dollars this quarter will comes up heads. He said sure why not, and bingo, the double headed quarter came up heads! He told me beginners luck, so I said how about double or nothing? He agreed, and bingo, landed on heads again. I'm starting to love my new lucky two sided quarter!" "I love this magic two sided quarter. I use it at every party I go to. If there are lots of people at the party, I also take out my two headed nickel, and mix it up with normal coins. People get so frustrated and think there is some magic magnet causing it to come up heads everytime. Since the quarter is made from two real quarters, everyone think its the real thing. This magic trick is a classic!" Very Realistic - Guaranteed to Fool Your Friends! Want to win the coin toss EVERY time? Tired of being the one to go on a pizza run in the middle of a blizzard? With the highly realistic Double Sided Quarter you’ll never come up tails again. Simply flip the double sided quarter a few times and watch your audience as they wonder how the quarter is magically coming up heads each time. Simply switch your double sided quarter with a normal quarter out of your pocket. If you hang around indecisive people all the time, this double sided quarter is going to be your dream come true. Stop wasting time trying to decide what to do, and pull out your double sided quarter. When your quarter comes up heads, you have just decided what you are going to do. The double sided quarter will save you lots of time! The double sided quarter is very convenient to use as a quick gift idea or for Christmas stocking stuffers. Makes a great gift for all ages. The double sided quarter is sealed brand new in package. Your double sided quarter comes sealed in package. Makes a great gift for all ages.